DETROIT – Comerica Bank, in partnership with the Detroit Grand Prix, is surprising some lucky students at Cass Tech High School with a field trip to Belle Isle to get an exclusive, behind-the-scenes experience during Comerica Free Prix Day. The group of students from Cass Tech’s various STEM clubs, organizations and classes will receive the surprise invite at 1 p.m. March 27 from IMSA driver Pipo Derani, who will also bring a Grand Prix Indy show car to the school. After the surprise announcement, students will get an opportunity to ask questions during a panel discussion with Cass Tech grad Christine Moore, who is now the executive vice president and general auditor for Comerica Bank; Laura Klauser, Cadillac Racing program manager; and Michael Montri, general manager of the Chevrolet Detroit Belle Isle Grand Prix. “Partnering with the Detroit Grand Prix for this signature event is something we look forward to each year. It provides us with the opportunity to connect the community, free-of-charge, to an iconic Detroit tradition,” said Monica L. Martinez, Comerica Bank Senior Vice President of External Affairs. This is the seventh consecutive year Comerica Bank and the Chevrolet Detroit Grand Prix will bring this unique opportunity to students in Detroit. Previous recipients of the Free Prix Day field trip include girls at the Detroit International Academy for Young Women; Cody High School’s Detroit Institute of Technology; and Martin Luther King, Jr. High School and University Prep Science & Math Middle School students. 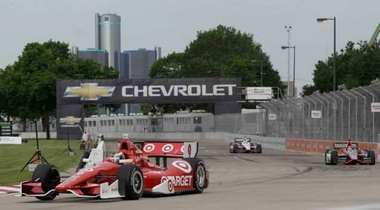 On the track, fans who attend Comerica Bank Free Prix Day will get to witness racing action from all three series participating in the 2019 Chevrolet Detroit Grand Prix presented by Lear. Comerica Free Prix Day includes NTT IndyCar Series practice sessions along with qualifying and practice sessions for the IMSA WeatherTech SportsCar Championship and Trans Am Series presented by Pirelli.